Not only does Kieran Tierney sit in with the Celtic support- he retweets the pictures of him among the Celtic support. Yesterday at Perth was another day on duty for the lifelong fan who took his seat behind the goal as Brendan Rodgers’ side looked to re-establish their six point lead at the top of the SPFL table. 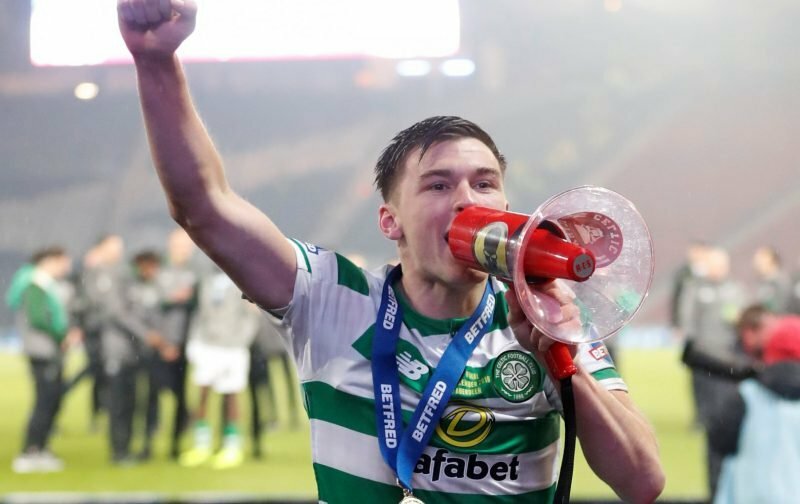 Tierney hasn’t pulled his boots on since the December 13 Europa League tie with RB Salzburg but watching the match at home on telly has never been an option for the Bhoy from Wishaw. Being pictured with supporters seems a real pleasure to Tierney, there is a smile in every picture whilst some other so-called celebs look as if they’ve just been handed an unexpected tax demand when they are pictured with the fans that create their status. It was a tense afternoon at St Johnstone for the Celtic support as they watched Odsonne Edouard get stretchered off after the briefest of substitute appearances. Timo Weah looks like a bhoy on a mission as he replaced his former PSG team-mate, creating the opener for James Forrest then securing the points with an 89th minute clincher. Watching from behind the goal was Tierney- all fans will be delighted when he gives up his seat with his mates for a place on the park as the hoops go chasing an eighth successive title win.